It has been a quiet two weeks in the publisher-advertiser industry, but there are still significant news we want to share with you. From mobile ad revenue challenges to new Facebook AI technology, there is a growing undertone of what the industry is heading for. 2015 has certainly been the year of growth for the mobile advertising industry. With high expectations and fast moving technologies it has been difficult for publishers to keep the pace and also make revenue from the beginning of the mobile era. The main issue is that there is a growing gap between mobile users and mobile revenue. 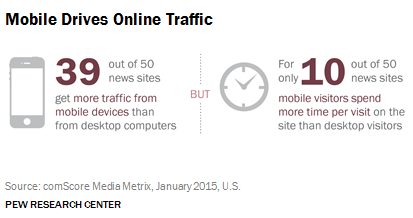 Figures from Pew Research Center show that mobile devices serve half of the traffic to 39/50 top media sites. Though it sounds high, the actual income made from this traffic is much lower than on desktop as users spend less time browsing which means less time to click on ads. In addition many sites have not optimized their mobile versions to serve content or ads well to their readers, which means users are put off from using those sites again. This period might be a bit unsettled for many publishers as mobile gets unfolded in all areas. This means that as a publisher you should be working on staying in the game by optimizing what is working for you and making changes for a mobile world. To optimize your revenue from what you already have, you should be looking at other forms of advertising that are not your traditional banners. In-image advertising offers publishers a fantastic opportunity capitalize on new real estate that they had never received revenue from before. At imonomy we work with some of the biggest publishers worldwide, if you are interested in this method of increasing your site revenue contact us for more information. With 200 million unique users per month, it is not surprising that Buzzfeed has entered the premium group of platforms working directly with WPP. Currently the WPP buying section GroupM spends $76B on advertising campaigns, here are some of their clients; $120m on Twitter, $130m on AOL, $430m on Yahoo, $1bn on Facebook and more than $3bn on its biggest client, Google. This move into new media and the native advertising sphere is looking promising for WPP who have a vision of creating more branded content, rather than relying on traditional banner displays. Though no one has officially stated what the non-exclusive partnership will result in financially for Buzzfeed, it has been estimated to be in the multi millions. One of the biggest perks WPP will get for this partnership is access to Buzzfeeds “Pound” data technology, which will enable them to track and analyze how content is spreading. What should publishers learn from Buzzfeed? Though it is a great addition to WPP’s inventory of large platforms, the access to Buzzfeed clients is not crucial to their finances. What does seem to matter to WPP is the access to Pound, and the information they can use from it. As it is becoming increasingly difficult to get information online, publishers that have mass data about usage habits of their readers and consuming behavior have much more of an appeal when it comes to large agency deals. Great news for those of you networking on the professional social platform, they are rolling out a new design for their inbox that is going to make it much more user friendly and will keep you on the site for longer. This design will be changed on both desktop and mobile platforms which will make engagement in the inbox much more flexible. New features will include: easier notification and connection with people who send you invitations, adding emoji’s and attachments to messages, and an overall more fluent messaging feel. In the last month LinkedIn released an app called Lookup which helps you find out more information on your co-workers and their backgrounds. 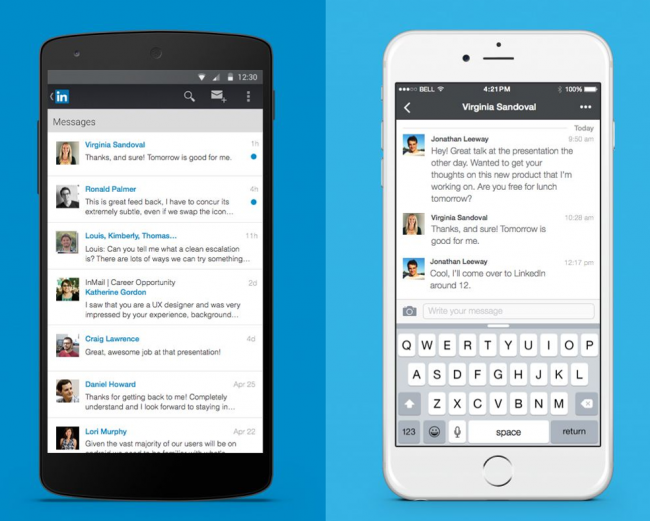 In my opinion, this expansion by LinkedIn as well as the new inbox look is showing their journey at moving from just a professional networking tool to a more complex and dynamic CRM tool. 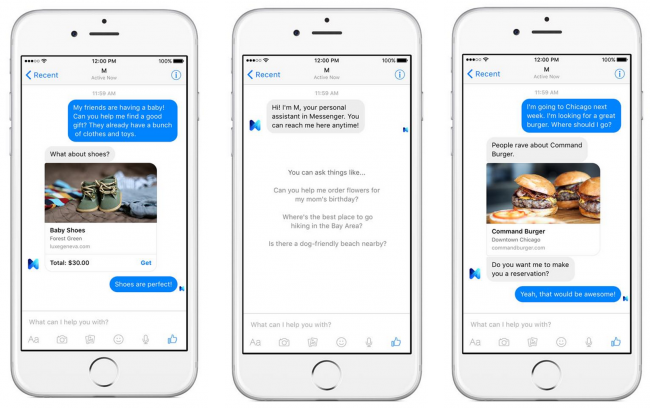 Last week Facebook announced its futuristic vision and reality of a new AI personal assistant called ‘M’. This is just a beta testing phase, but if you read between the lines you can see the direction the social media giant is taking. Though currently Facebook can afford to spend a lot on hiring human helpers to be the backbone of the service, it is thought that eventually the virtual assistant will need minimal human input to function. If Facebook is growing at the rate that was announced last week (1 billion users active in one day), it looks like the market is huge and waiting. How will this affect advertising? Though it hasn’t been revealed how the AI technology works, it looks like Facebook could well integrate its programmatic ad selection to be incorporated into the recommendations that the assistant makes. This will open up a new medium for advertisers to get on board with and make even more targeted sales, straight in people’s phones. This type of technology has been tried out before by companies like Apple, but with the financial ability of Facebook this feature might just take off. The day has come to say goodbye to flash advertising. In June Google announced that it was going to be an end to auto – playing flash ads on Chrome, and it has been reported that the update will happen today. Google is not the only one to be blocking Flash ads, also Mozilla and Facebook have been slowly pushing out Flash and replacing them with HTML ads. One of the main benefits that publishers stand to receive from this movement is faster loading time in their site and users will see less battery drain on their devices. Google has already recommended that advertisers switch to HTML 5 to avoid being blocked by the new default setting on Chrome, and since 2012 most publishers have switched to HTML 5 use only with only around 10% of sites still support flash. IAB have provided a guide for ad designers and creative technologists that that is worth keeping in mind. What news is affecting you the most? Let us know about your concerns and what you are doing to overcome them in the comments below.